At the Neverman Flooring Research Center (AKA our home), the boys have been doing their best to subject our eco-friendly flooring choices to a battery of tests sure to rival those in more high tech facilities. Mud, crayon, lotion, chocolate milk, hammers, ball bearings, firewood – no substance is too messy and no impact is too large. 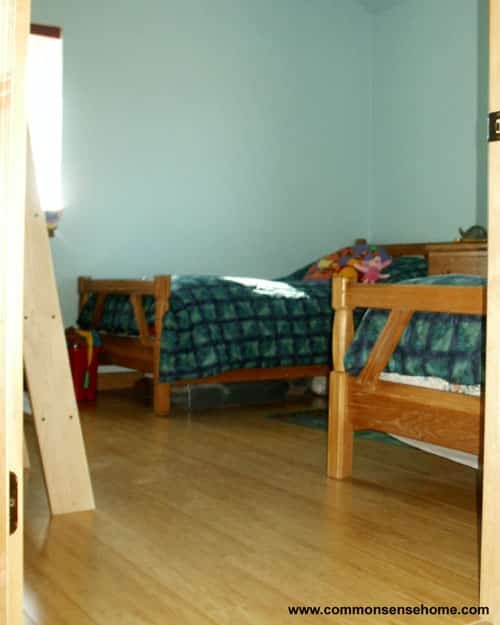 We evaluated durability, ability to conceal dirt, sound absorption and appearance. Here are the results. Throughout the home, we used hard flooring. The only carpet is in the boys’ loft. This makes it easier to get around with a walker or wheelchair and improves indoor air quality (carpet tends to trap dust and other allergens). Our primary source of flooring was Eco-Friendly Flooring in Madison. They have a great selection of environmentally friendly products, from sustainably harvested wood flooring to recycled metal flooring tiles and sinks and recycled glass wall tiles. Their flooring and shipping prices compared favorably with other suppliers, including volume discounts for orders over 500 square feet, and they offered products that we could not find at any other local dealer. 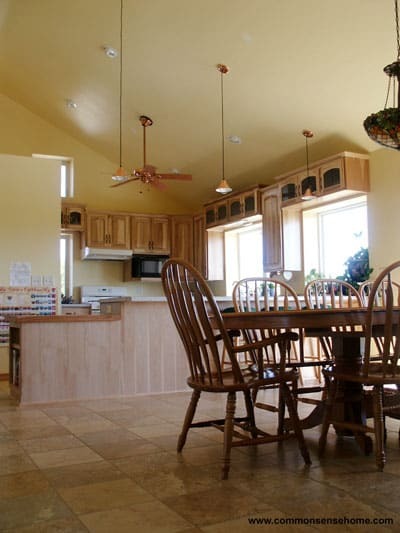 We chose to use their Sunflower linoleum in the kitchen and laundry room (photo above). The linoleum comes in 3′ x 1′ x 7/16″ click-lock tongue-groove flooring planks with built-in cork underlayment. Eco-Friendly Flooring carries a palette of over 20 colors, providing plenty of decorating options. It cleans up easily with the broom or vacuum. For deep cleaning, damp mopping with a vinegar and water solution is recommended (this is true for the cork as well). The dappled yellow of our Sunflower camouflages dirt quite well. It is also forgiving when things get dropped, unlike tile. The underlayment provides some cushion when you’re standing for extended periods, and it muffles the sound of footsteps better than tile or hardwood. Eco-Friendly Flooring also provided us with Caramel Burl cork flooring for the computer room. We put down hardwood floor protector sheets under the computer chairs, but the boys still roll around quite a bit on unprotected floor. It has gotten some minor scratches, but the pattern of the cork makes them almost invisible. I had some concerns that it might absorb moisture (it looks porous), but when Duncan upended a large glass of chocolate milk over half the floor it wiped up quickly and cleanly. There has been no residual odor, which would have been expected if the milk had soaked into the floor. It is anti-static (as is the linoleum) making it a good choice around electronics. 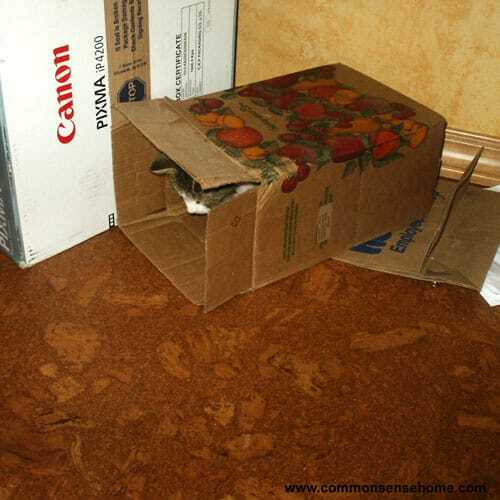 It also provides a high amount of noise reduction. The cork floor was also the site of the ground-in crayon application. With a clean, dry paper towel and a little elbow grease, it wiped right off. The final product we used from Eco-Friendly Flooring was Natural Fibrestand Woven Bamboo. We ordered bamboo samples from several different suppliers, but when we looked through the brochures we found that many of them did not recommended the use of horizontal or vertical bamboo over radiant flooring systems. Our flooring installer said that heat was not a problem, only changes in indoor humidity, but we weren’t comfortable with his recommendation. We did some more research and found out that strand woven bamboo was approved for use with in floor heating. Both Eco-Friendly Flooring and our installer recommended a nail-down application rather than a floating floor over the radiant heating system. So what’s the difference between the different types of bamboo? All of them are laminates. In horizontal and vertical bamboo, which are the most commonly used, you can see the individual pieces of bamboo butted up against each other. Horizontal has the strips laid flat and consists of multiple layers; vertical places them on their sides in a single layer. Horizontal planks are generally tougher than vertical. Strand woven bamboo is constructed from shredded bamboo strips that are compressed into planks. It is harder than both horizontal or vertical bamboo planks and is suitable for commercial applications. When we compared the samples we had ordered, we found that the strand woven was also about twice as heavy as the others. Because the bamboo is shredded and compressed, the floor also has a more “wood like” appearance. In addition to the different construction options, bamboo also comes in natural or carbonized colors. Natural is lighter in appearance, carbonized is darker. The carbonized is actually steam treated to produce the darker color, which weakens the plank as much as 20%. See GreenFloors.com for more detailed information on bamboo flooring. I would heavily recommend getting samples before purchase. There are a lot of companies that have cropped up on the internet selling cheap bamboo, and in some cases you get what you pay for – or less. Our bamboo is holding up great and gives the bedroom floors a warm, welcoming glow. On the practical side, the tile pattern and the light coffee colored grout hide dirt really well, too. The biggest tile negative is the increased noise level (the boys like to race each other on wheeled office chairs through the length of the house and you can hear every grout line). We’ve only shattered one item by dropping it on the tile (a Christmas bulb), so that hasn’t been a problem. Porcelain tiles are more durable than non-porcelain tiles (porcelain tiles are a type of ceramic tile, but not all ceramic tiles are porcelain) and are less water absorbent, so they will continue to look good for many years to come. (Duncan verified the tile durability by tapping it repeatedly with a hammer to listen to the nice “ping” noise that it produced – until he was caught by his father.) For more information on tile, see The Tile Council of North America FAQs. In the finished area of the basement, we hired a concrete contractor (CTI – Concrete Technology Incorporated) to acid stain and seal the floor. Since we used the existing concrete floor, there is nothing to interfere with the heat transfer from the radiant tubing underneath. After the floor was cleaned but before the staining began, August and I drew out a compass rose on the floor at the base of the stairwell with indelible marker. The contractor used tape to mark out gridlines, providing a tile look without the tile price. Several layers of stain were applied, the tape was peeled off and the unstained strips look like grout lines. A couple layers of sealant were applied over the color and it was done. We are very happy with the results. 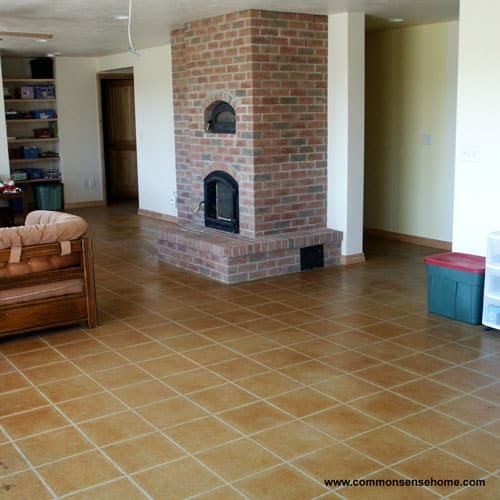 The floor has really taken a beating this winter, as we regularly bring in yard carts full of firewood for the masonry stove right through the middle of the room. Snow, ice, mud – it all gets tracked in. Fortunately, it cleans up easily. All I regularly do is run a broom around, occasionally I vacuum and mop. The down side is that the actual chemicals used to stain and seal the floor stink, so you can tell there are VOC’s (volatile organic chemicals) involved. Fortunately, the fumes were short lived. There are some concrete coloring products that claim to be more environmentally friendly, like Kemiko’s Rembrandt Polymer Stain. We didn’t find anyone in our area that was using this product. We are very happy with our flooring choices. They all hold up well to heavy wear, dirt, grime and little boys. Acid stained concrete, tile and bamboo are the toughest, but also the noisiest, cork and linoleum are not quite as tough but are quieter, anti-static and gentler on the feet. I highly recommend including any of these products in your new home or remodeling project, along with sustainably harvested hardwood floors. Thanks for this. We really need to replace the mostly broken ceramic tile floors in our kitchen and mudroom (hey, thanks kids!) and I’m thinking that linoleum would be ideal. In the years since I originally wrote this, I have found that there is some minor amount of warping in the linoleum tiles in area that are more moist (like at the base of the toilet in the laundry room). It’s not enough to be an eye sore, but I notice it. Just wanted to give you a heads up in case your mud room tends to stay muddy. Very interesting. You have me thinking. I do wonder, however – I think I have heard that tile and hardwood don’t work well in basements due to moisture issues. Thoughts? Also I am sort of envious of your linoleum choice for the kitchen due to breakage issues (we have tile that is beautiful but not nice on glass :-(.) but I notice that you did choose the tile in your DR. Now that I think about it, I guess more breakage goes on in the kitchen. My main linoleum question is – isn’t it prone to peel up? 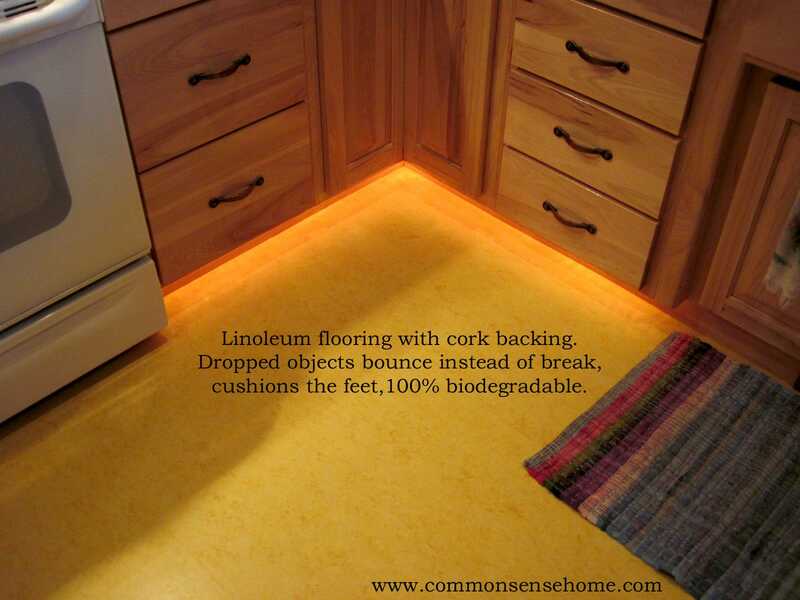 I have seen that in so many homes w linoleum that I would be concerned about that. Are newer versions less prone to that issue? For comfort I do like the warmth of the current carpet in the basement but I would be interested in the tile options otherwise. Do you not find it is too cool? That was another of my concerns. Thanks! It’s now seven years and counting since I wrote the original article, and overall the flooring is still all holding up quite well. I’ll go through your questions one at a time. We put an area rug in the basement where the boys would play more on the floor. In the summer, yes, it’s cool, but in the winter the in floor heat is on. Seven years and counting, and thus far nothing has been dropped/shattered in the dining area, and the boys were pretty young when we moved in. Coffee pot and pyrex storage containers have both survived being dropped on the linoleum. We choose tile in the dining area primarily for its superior heat transfer (in floor heating), durability, and just the way our floor plan laid out. The home is very open concept, so the tile runs from the entries at the east of the house, along the main traffic corridor through the dining and living rooms, and throughout the dining and living room areas (its all one big open space) and into the main bathroom. On the linoleum – thus far, no peeling. Our linoleum did come in planks, not sheets, which are about 1’x4′ and 1 inch thick. The only real wear I’m seeing at this point is a minimal amount of widening of the seams (next to the toilet, for instance, they have gone from “invisible” to “hairline”. In the highest traffic areas of the kitchen you can now see the seams more easily if you look closely. Eyesore – no – I just notice it because it’s different than it used to be. Also, the boys are no longer allowed to ride their scooters into the kitchen, as they did manage to scuff the linoleum in one spot. We don’t have any sidewalks out here, so they ride their scooters inside down the main walkway and in the basement rec room. Thank you for sharing this. Our 1985 house has the original sheet vinyl in the kitchen, laundry, and master bath (kids’ bath was retiled last year). I had originally planned to ceramic/porcelain tile those areas but am beginning to waiver…it is so hard underfoot. The linoleum is very intriguing. Could this be installed by an average DIY’er? I think a reasonably handy DIY family/couple could manage the install. One person it might be a little trickier, but could probably be done, too, depending on if you used the planks or the sheet linoleum. The planks have more cushion, too – about an inch of cork backing. Uh Oh. First problem would be my husband isn’t so handy. I love him dearly, but all the shop tools are mine. Second problem would be I had thought of doing the planks but raising the floor that much would cause problems where it transitions, as well as door thresholds–I’ll research sheet linoleum some more. I did sheet vinyl years and years ago but it was a small room, no seams. But maybe we could do something very inexpensive now and save for the big kitchen renovation down the road….just thinking outloud. I just came onto your post and found it quite interesting. I am also associated with tiles uk, swimming pool tiles, tile suppliers , and love to enjoy the stuff on the same as its rarely found on internet. Thanks again for writing such a good post.